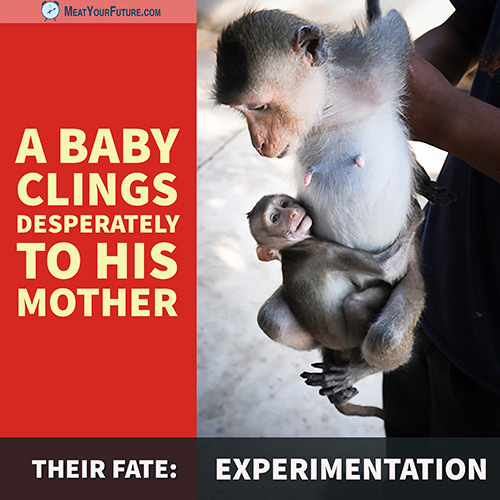 A macaque monkey breeder shows off his “product”: a baby clinging to his mother. The fate ahead for these two individuals, as well as the millions of other animals used for experiments, is truly horrific. From cranial trauma (i.e., being hit in the head), to intentional burns and wounds, and even psychological torture, there is no moral basis for subjecting animals to such horrendous abuse. Why do we think everything on this planet, including every animal, is here for our use and disposal? Do Animals Have a Right to Live on this Planet Too?